If you can answer yes to the following questions you'll want to get your hands on the Ghostwriting Made Easy Crash Course Package! 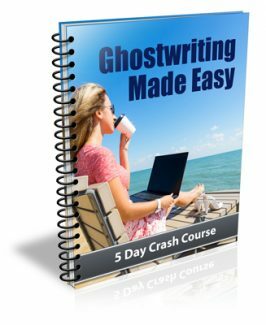 The "Ghostwriting Made Easy" course was specifically designed to show even absolute beginners what it's like to run a successful ghostwriting business. Even if your readers don't have clue how to get started as a ghostwriter they will quickly understand what it take to become a highly sought after well-paid writer for hire! The entire course is easy customize. With a few clicks of your mouse, you can add your contact information to all of lessons in the series at once. The "Ghostwriting Made Easy" package contains everything you need to start using it right away! It doesn't matter if it's 2:00 am, you will get instant access to this entire package. Once your payment is approved, you will be taken to a special download page where you will have instant access to the Ghostwriting Made Easy course, including the lessons, web pages and custom graphics package. Grab the "Ghostwriting Made Easy" crash course package complete with private label rights today and start using it to build your list and educate your subscribers right away!